Water is indispensible for sustainable agriculture. For our country, which cannot be considered in terms of water resources, using water efficiently has vital importance. 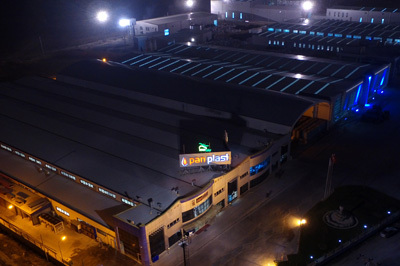 With this conscious, in order to ensure efficient use of water, Panplast Sulama Tarım San. Ve Tic. A.S., founded in Cihanbeyli in 2006 by Konya Şeker San. ve Tic. A.S., which assumes encouraging irrigation with drip irrigation and ensuring drip irrigation becoming widespread as a responsibility for the future of the agriculture of Turkey, is active on 215.000 m2 total area today. The facility, which has state of the art technology, has become the pioneer and leading institution in the sector by specializing in Drip Irrigation Systems with the new investments, made after the initial investment. The plant, which can produce all kinds of sprinkler irrigation, flat and round drip irrigation systems, is the first plant in our country to produce flat drip irrigation pipes. Preventing flat pipe import through its flat pipe production, the plant both prevented loss of foreign currency due to import for our country and decreased the costs of irrigation equipment of producers by ensuring drip irrigation system prices to half of that of imported products and encouraged drip irrigation systems to become widespread. Specializing in plastic products, the plant began production of PVC pipes, drill pipe, outside posts, corrugated pipe, PP sack, net pipe and bale string production after 3 new investments, consisting of PVC and CORRUGATED Pipe Production Facilities and Sack Factory, completed in 2012. Injection Plant, where plastic europalet and food packaging production takes place, Film & Print Production Plant for agricultural packaging and food packaging production and Recycling Facility to make plastic waste to be reusable without harming the environment, were put into operation as of 2014.